"...the true worshippers will worship the Father in the Spirit and in truth." Vikki is a Chicago-based actress, voice-over artist and vocalist who performs one-woman shows for women's conferences, and leads musical worship. She's also a passionate marathon runner, and recently resumed training for the 2019 season. One of Vikki's musical hosts is Reverbnation where her music is constantly in the Top Ten of plays among gospel musicians in the Chicagoland area. This season Vikki has two songs from her Christmas collection featured in repertoire for purchase or download: Her popular, jazz-tinged, "What Child Is This?" and the rereleased medley, 'Silent Night with Isn't He?" Keep watch here for specials deals. Vikki also includes her unique arrangement, "The Christmas Song Gospel" as part of the playlist in Kingdom Impact Theater's celebrated, "Carol Story," the spoken word one-act play consisting solely of lyrics from Christmas carols. This year, catch the original KIT ensemble -- Vikki, Mike and Garlan -- back at Connection Church in Libertyville, IL, Sunday, December 23. Don't be fooled by solo. 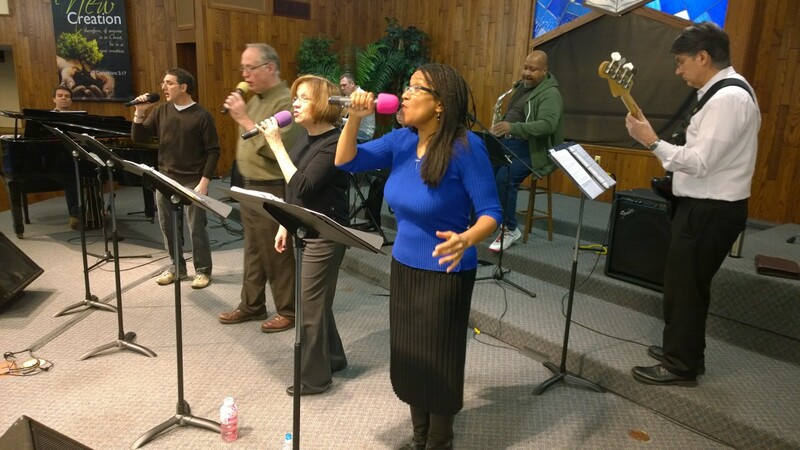 True, Vikki's repertoire that ranges from classic hymns to recent worship praise is delivered with her unique gospel-jazz interpretations that are designed to entertain. But, for Vikki, entertain is only part of her musical mission: "engage" and "educate" are also part f her lexicon. That means that along the way in a concert, there may be a word of Scripture, a snippet of testimony that speaks to you in such a way that you speak back to her and next thing you know, everybody's singing like they haven't sung before. Whether harmonizing in an ensemble, poetically sharing Scripture, or being the congregation's main encourager, Vikki strives to join all with The audience of One. ​Although tagged as a "worship leader," Vikki is more accurately a "leader of worship," for she recognizes that worship is not a synonym for "music," but a holistic experience that involves Scripture, the music and tech worshippers, the platform presenters -- even the announcement readers -- into fellowship with the pastor's plan to receive God's message. Collaborating with like-minded singers and musicians, and experimenting with traditional songs, Vikki has created original music and discovered God's gospel hidden in lyrics of "pop" songs. As a result, her recorded mus has so impacted people across the globe that listeners from unexpected places as Ukraine, Israel, Iraq and Saudi Arabia have written to appreciate receiving God's word through her voice.